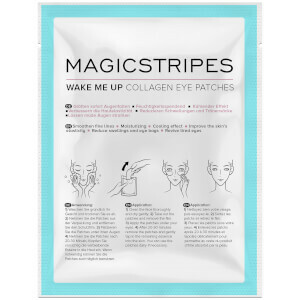 Revive tired eyes with the MAGICSTRIPES Wake Me Up Collagen Eye Patches; a pair of cooling eye masks that are designed to offer an added boost to tired and mature eyes, whilst also possessing anti-ageing benefits. Offering a cooling effect, the eye patches work to reduce the appearance of swelling and puffiness around the eye area, as well visibly brightening dark circles. Each mask is enriched with a healthy dose of Collagen, which seeks to improve skin’s elasticity and leave skin youthful and glowing. Finished with Hyaluronic Acid, the potent treatment offers a veil of moisture, alongside enviable anti-ageing qualities. Expect nourished and hydrated skin. Free from parabens and animal cruelty. Take out the patches and remove the film. 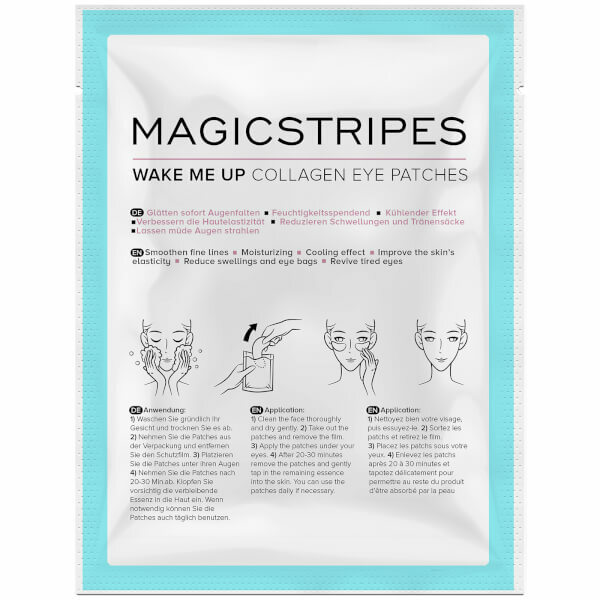 Apply the patches under your eyes. After 20-30 minutes remove the patches and gently tap in the remaining essence into the skin. You can use the patches daily if necessary. Aqua, Algin, Glycerin, Sodium Pca, Aloe Barbadensis Leaf Juice, Collagen, Trehalose, Sodium Hyaluronate, Tocopheryl Acetate, Niacinamide, Palmitoyl Hexapeptide-12, Palmitoyl Oligopeptide, Phenoxyethanol, Parfum, Rosa Centifolia Flower Oil, Arginine, Ethylhexylglycerin, Serine, Geraniol, Citronellol, Linalool, Citral, Eugenol, Farnesol.